Last year I started to use my local library more. I like supporting the library and it's nice to save a bit of money by not having to buy EVERY book I want to read! My library has both eBooks and paper books. If they don't have a book, I can search all the libraries in Connecticut and usually borrow it with an inter library loan. I started listing my "Library Loot" last year too, so when thinking about reading challenges this year, the 2015 Snagged @ The Library Reading Challenge just seemed to fit. This reading challenge is hosted by Felicia from The Geeky Blogger's Book Blog . 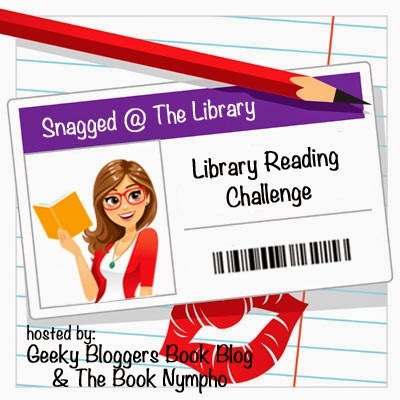 • To join this challenge, grab the 2015 Snagged @ The Library Reading Challenge button and post this reading challenge on your blog to track your progress. Please include a link (Here's the link!) back to this sign-up post so others can join the reading challenge too. You do not have to be a book blogger to participate; you can track your progress on Goodreads (so as long as you have a dedicated shelf and Felicia has created a Goodreads group), Shelfari (I’ve created a Shelfari group. You can join and post your progress within the group), or BookLikes, etc., for the 2015 Snagged @ The Library Reading Challenge. The point of linking up is to have a place where people can see what you’re reading. Last year I took out 12 plus books from the library and read 12, so I'm going to sign up for the Dewey Decimal Level and read at least 12 books. I think that's doable without stressing myself out. And that's what reading challenges are suppose to be - FUN! and not worrying about how many books you've got to read. Up for challenge of supporting your library and enjoying free books? Join me in the 2015 Snagged @ The Library Reading Challenge! I'll be listing the books I've "Snagged at the Library" AND the ones I've read and enjoyed right here and at the top of my blog under "Library Loot 2105". Thanks Felicia for hosting this reading challenge! Hi Tracy! This challenge would definitely be up your alley! I love my library too! In fact today I picked up quite a few books-- all the books I requested came in at the same time!